In 2009 PRC staff was horrified to hear about the increasing loss of human life due to the extreme heat in neighborhoods we serve. How could we help? We launched the "Sizzling Safe Summer Campaign". The mission is to provide information, resources and activitiesthat promote safety in the intense Arizona heat. 20 Minupresentations are made for organizations or groups that include topics such as: Wellness Checks, CPR, First Aid, Hydration Centers, Skin Cancer, Heat Stroke, Eye protection, Hazards of hot cars (animals and humans), swimming Lessons and Pool Safety. Every site receives a $50.00 gift card to celebrate and pledge to get the word out! Register below for a presentation. FREE TO THE PUBLIC (organizations/groups only)! 2. POOL PARTIES DJ playing great, clean, fun and family friendly music, an emcee that gets everyone moving and engaged. Good old American hot dogs and chips and appearances by the City of Phoenix Aquatics mascot “Buddy Bear”. Grass skirts, leis and a performance by the Kilali’s Polynesian Dance Revue make it for the whole family. The message of staying safe in the heat is shared with all. 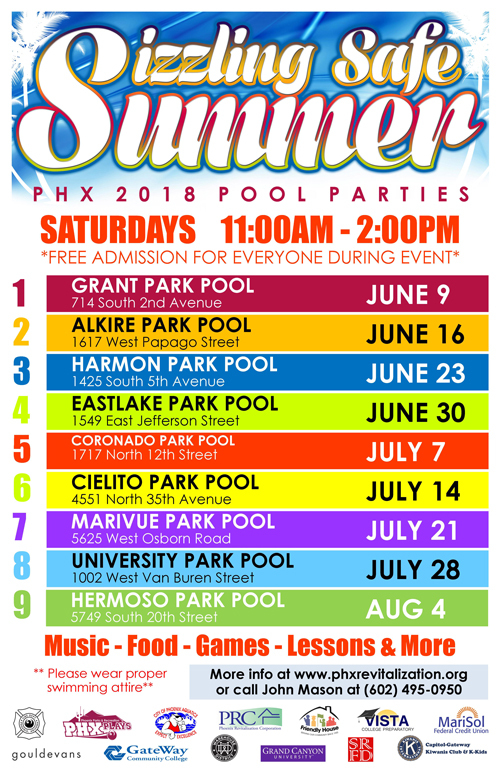 View Pool Party schedule below. FREE TO THE PUBLIC! 3. SOCIAL MEDIA/PUBLICATION Tweets, Facebook and articles in our Central City South newsletter promoting the topics of heat safety.